Back in July 2005 Pope Benedict XVI made some off-the-cuff remarks to a group of local priests while on vacation near Aosta in the Italian Alps. He was discussing the self-sufficiency and neglect of Christ and Christianity which dominated Europe. "The mainstream churches appear moribund", he said. Then, out of the blue, he commented: "This is so in Australia, above all, and also in Europe, but not so much in the United States." This sent the Australian media into high dudgeon and like other Catholic commentators I spent a week trying to explain what Benedict might have meant. Why we were targeted is hard to fathom, although it suits both secularists and bishops to maintain the notion that Australia is 'Godless' and the churches 'moribund'. For secularists it shows that they’ve been right all along. They claim religion has always been a sectarian blight on Australian life. If we all embraced the 'who cares about doctrinal differences' and 'it’s the same God we worship' approach, Australia would evolve into a more tolerant, terrestrial paradise. On the other hand bishops use our presumed ‘Godlessness’ to claim the collapse in religious practice isn’t really their fault. It’s not church structures, poor leadership, dull sermons, uninspired ministry, lifeless worship, or failure to address the real issues facing society that has led to so many people to abandon the church. It is all the fault of crass materialism, relativism and Godlessness. Therefore, it’s society that has to change, not church leaders. 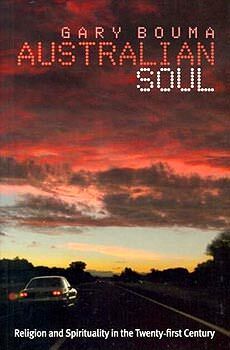 However a recent book, Australian Soul (Cambridge, 2006), by Professor Gary Bouma of Monash University argues that Australians are not Godless. We’re quietly spiritual rather than explicitly religious, holding on to what Manning Clark called 'a shy hope in the heart'. Bouma says that Australian spirituality is rather understated, wary of enthusiasm, anti-authoritarian, optimistic, open to others, self-deprecating and ultimately characterized by "a serious quiet reverence, a deliberate silence ... an inarticulate awe and a serious distaste for glib wordiness." It could be argued that these characteristics are secular and that to use the word spirituality to encapsulate them is a misnomer. However, it is the reference to 'reverence' and 'awe' that spiritually transforms these attributes. Bouma says that part of the problem is that we unconsciously tend to judge ourselves by the rather ostentatious religiosity of some American Protestants. Australians are far more understated and reverent. Bouma has argued for two decades now that faith and spirituality are not marginal to Australian life, and that the large majority of Australians have usually thought of themselves as believers, and today identify with some form of personal spirituality. 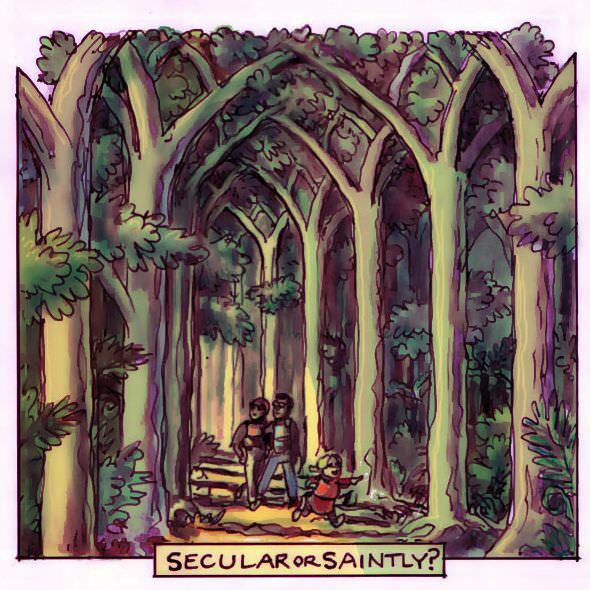 Throughout much of the twentieth century and certainly after the1960s the predominant view among the chattering classes was that 'meaning' questions would all eventually be solved by science and that Australia was an explicitly secular society, with an odd and contracting remnant group of 'god-botherers' maintaining the faith. However, Bouma has argued that most Australians described themselves as religious persons even back in the 1970s, the heyday of triumphant secularism. This doesn’t mean that people are flocking to churches. They are not looking for pat answers and don’t need a religious authority to tell them what to do. They are suspicious of institutions with all the answers. They are content to live with the questions and certainly want to take charge of their own spiritual lives. The churches that are growing — albeit off a small base — are other Christian, oriental Christian (i.e. the Orthodox whose increase comes from migration), Pentecostals and Mormons. He points out that the mainstream Anglican, Uniting and Protestant churches are still in decline. With parallel declines in New Zealand, Canada and the US, Bouma claims that "this represents the waning of British Protestantism." Bouma is more optimistic about Catholicism which he sees as differently positioned. While he concedes that there have been some slides in attendance and that Catholicism has much larger parishes than the other churches with a very high priest to people ratio, it has a strong system of schools and institutions which he thinks will sustain it. He points out that parents increasingly want to enroll their children in non-elite Catholic schools because of the discipline and values-based education that they offer. While I think he is over-optimistic about the Catholic church, his views are a refreshing antidote to the prevailing pessimism about Australian religion and sit in marked contrast to those of Benedict XVI. 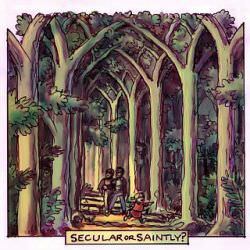 I found this to be a good review by Paul Collins of what looks like an interesting and important book - and I loved the apposite drawing of bushwalkers quietly walking through a cathedral nave of tall gum trees. Many of us have had such perceptions in the bush. Bouma's book looks like an important contribution - though Bouma may not have perceived it in this way - to the depressingly superficial and politically motivated "debate" about "Australian values". I do believe we are a spiritually aware people - or at least, many of us are becoming more so. We are learning from the spirituality of our indigenous people - even if we do not yakkety-yak very much about it. The usual reasoned comment from Paul Collins, I always find his views a comfort and caring. Thanks to him for the writing and to you for the publishing. Rosemary K.
Personally I am more inclined to take notice of what Paul Collins has to say than any of the utterances of Benedict XVI. The decline in the Catholic church is ,in my view, due to clergy, poor leadership, dull, patronising and irrelevant sermons, uninspired ministry, lifeless liturgy and subservience to politics of the Left. The Vatican bureaucracy has no idea of the realities of the 21st Century.It will take a revolution in the church from Africa and Asia to restore Christianity. I think Paul knows what he is talking about, for sure, but I think Pope Benedict has been much more moderate than many people anticpated and predicted, and one should not be too quick to judge. I think Keith Hancock has got it wrong, very wrong. I dont think you can just say that all clergy are dull, or that all liturgy is uninspired. My priest is a wonderful man, and we have a vibrant community. I think it depends on the persons involved. I also think there is tendency for some people to be too quick to bash up the institutional church. After having read this article ,I am prompted to question the type of agent/agents who report back to Benedict XVI;also,how Australian Spirituality is interpreted by the "reportees" back to the Vatican. Perhaps I am too sceptical about these issues! Much of what Paul has said makes sense but what I would really like to hear from someone of his ilk (or him) is an explanation of how the Uniting Church has lost a greater percentage of participants than the Catholic Church by following a progressive path, one in which many of Pauls points have been addressed. I think it's hardly likely that such attempts will result in a renewed interest in Christianity in any more than very select quarters. Thanks- Eureka St., Paul Collins, Gary Bouma - & the artist. The beauty of nature (and architecture and music that reflect that) allow one to breathe, unlike eg last Sunday's sermon here on Mt 25, identifying the "sheep" as the right sort of Christians, and mainly concentrating on the everlasting nature of hell. But many "fundamentalist" Anglican churches are growing and producing not only many ordinands (45 this year in Sydney) but also some winsome and deeply devout Christians. We could learn from them. On the other hand, Sydney's regime repels many others and too many good people whom I knew after many years in my western suburbs parish have just stopped attending church altogether after the unloving imposition of radical change. They do not cease to be spiritual. As an hon.hospital chaplain, every week I see large numbers who identify themselves as Anglican or C.of E.- 95 listed one day! Visiting people at a time of need of course is different to visiting at other times. But at those times of need one sees and is moved by the courage, faith, and "quiet spirituality" of so many. Most would attend church rarely if ever, though they often express appreciation that THEIR Church has called. I am a broad church Anglican, unitarian I guess (influenced by scholars such as Geza Vermes and Hans Kung, not by what seems to me the rather powerless "progressive Christianity" of Bp Spong and others. However, I also have a great love of Anglican tradition and of the Book of Common Prayer. Even in puritan Sydney, something of that tradition and structure remain. Here perhaps is part of the answer to Damien's question. The Uniting Church, for all its many merits, remains rather shapeless. Even adding "Methodist : Presbyterian : Congregational" to its name would help. The success of McDonald's points to part of the comparative success of the Roman Catholic Church. It has a common liturgy for the common people, for which good priestly training is available. When it is good, it is very very good. At 9am on Easter Day, for example, S.Mary's Cathedral was packed. The unobtrusive singing (with an orchestra) of Haydn's Little Organ Mass did not take away from the simplicity of the celebration. No Anglican pomposity. No overheads. No lengthy, intrusive "Peace". The Dean, assisted only by a woman server and a cantor, preached a short but fresh and thought-provoking sermon, all contributing to a "joyful Eastertide". Thank you to Paul Collins for a very interesting and thoughtful article. It expresses some of the thoughts and fellings I have had since returning to Australia after living and working in Indonesia for nine years. Many Indonesians are deeply spitual, including Catholics. However I have met and am now working with Australians, who are "quietly spiritual". I now hope to read Gary Bouma's book. Must get hold of that book - it sounds great and I couldn't agree more. Thank you for bringing it to my attention. IWhile studying during 1991 (then 52 years of age) at ACU Strathfield I reflected much on the 'ethical substance" (cf Hegel) of the Australian psyche and I cannot agree with the 'godlessness' tag. I soon gained a strong impression that 'aristocracy' is absent from Australain thinking in comparison with other original colonial settlements - it is non-feudal. On return visits I ahve retained those first impressions. 'Feudalism' is absent also in relationships with Church authorities - the 'ultramontanism' of many clergy that progress to significant positions, trained in scholastic erudition, is not acceptable to ordinary Australians. I agree that Australia is 'quietly spiritual - not only in Catholic circles. Many of the working class Irish who emigrated around the 1960s spoke gratefully of the 'salvis' (The Salvation Army). I marvelled at the 'spirituality' running through the counselling courses I attended, particularly the theories of the Dulwich Centre emanating from Adelaide - with Maori influences coming from Auckland.Therein I perceived an amalgam of Eastern and Western thought. Australian spirituality is can relate to the 'quiet and hidden spirituality of the Irish middle-class of the late 18th century whose parents had been honed and purified in resistance to penal legislation and from where its clergy issued from. Foundations of congregations of Brothers and nuns came from this laity, as also the secular organisations such as the Legion of Mary and SVD. Their influence is world-wide in spite of the ultramontanism that assumed control over Irish Catholicism from the 1850 Synod of Thurles and the transfer of Cardinal Cullen from the Irish College in Rome. Spirituality is not to be judged by attendance at religious services that are boring and irrelevant to the mediation between the good Lord and the spiritual aspirations of ordinary people, now better educated to see through the archaic limitations in which ministers are trained and must perform. Spiritual services are important where prayer and communal relating with God dominate. The banishment of subjective scholastic rhetoric would contribute to uplifting spiritual experiences and bring congregations back to services. An interesting review on a crucial topic. If this book is like Bouma's previous works it will be worth a read and a serious ponder. Like all research however, it only describes the groups who were surveyed. I'd like to know more about the author's homework. Thank you Paul for drawing attention to what it is about Australians, the descendants of those who came here and created the basis by which our society lives by today. They wre spiritual, not sectarian. Then along came the politicians, "the leaders", and all others whose powere resided on 'wedging', not combining to solve the problems we face. Good for Paul Collins (and Bouma)! I think it is certainly true and many of our younger people are not interested in a religion which seems to have no relationship to their everyday lives; that is primarily a list of 'you musts' and 'you must nots'. They want real spirituality and a proper awareness of God's presence and His love for them. I wish I knew how to provide that - then perhaps I would not have six children who never darken a church's door ! At the same time I am thankful that all my children are good living, loving people who live by basically Christian principles. Margot K.
I work with young people in a ministry role in my school and I would also agree that the young people wwith whom I work are spiritual and religious in the sense that they possess a deep awareness of a greater force in life and a profound sense of awe when confronted with the depth and passion of human living. Where I think we need to go is to promote this person of Jesus much more to young people and indeed for all Catholics. In this age of the rise of the "Superhero" (think Spiderman, Fantastic Four etc), we have as Christians, the ultimate hero in Jesus and to follow his way is truly awesome. I suspect that the spirit of Australians is persistent, but if it doesn't reach their soul then how can it be Godly? Symbolic gestures, whether at personal or at national level, are effective, even though they will have a barely measurable effect on water supply or global warming. Our world becomes different, and our sense of what has priority in it also changes.